As soon as the water is “warm” enough, we will do as many of our long swims in the open water as we can. 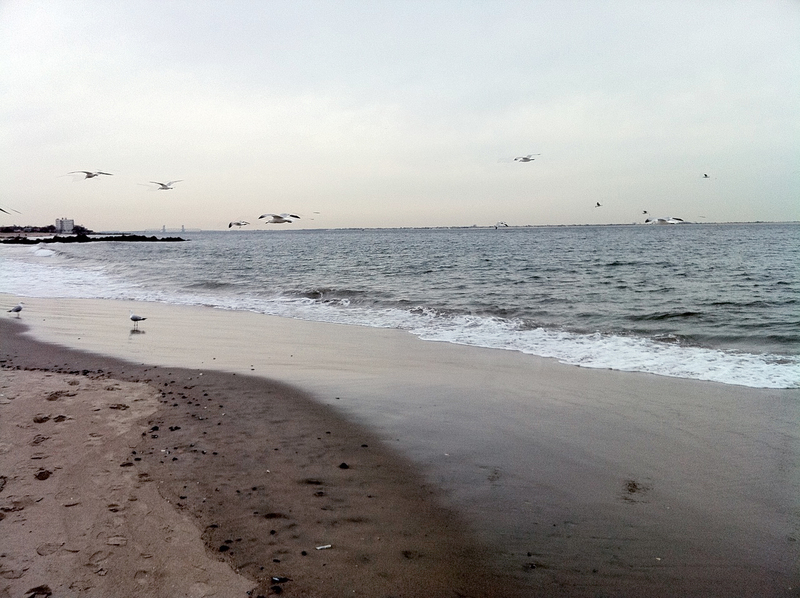 Many will take place here, at Brighton Beach/Coney Island. The first Saturday that we did a 6600 yard swim I felt ridiculously pumped afterward and thoroughly accomplished. This past Saturday morning’s 7200 yard swim* felt so easy, which was, of course, a different kind of feeling of accomplishment. One nice thing about our Saturday long swims is that every time we up the mileage, I set a new personal record for the farthest I’ve ever swam in one pool session. Endless opportunity for breaking a personal record = endless opportunity for feelings of accomplishment. No wonder I’m hooked. I just read a blog of an experienced open water swimmer whose “long pool swim” lasted 9 hours. Clearly, we will have opportunities to continue setting personal records for a long time! Saturday March 19th: Home by Edward Sharp and the Magnetic Zeros – I had heard this favorite song of mine sampled on NPR on my way to the pool. Saturday March 26: Ching Chong by Jimmy Wong – Wong wrote and posted this piece in response to this incredibly racist video posted by a UCLA student. I had heard Wong interviewed on NPR and then watched the video of Ching Chong the night before. It’s pretty great, but you have to watch at least a minute of the girl’s original video to appreciate it. Saturday April 9: Mostly silence! In the middle of the fourth mile, I began to hear Train’s Hey Soul Sister (no, I will not provide a link for this one). This time I fought it, and I fought hard. Thankfully, I got distracted by a pain in my right shoulder and the song was gone—best shoulder pain ever! Training many hours with buddies requires a common language. It seems to evolve on its own when needed. We swim a lot of our miles at what we call “forever pace,” which is supposed to be the pace we think we could swim indefinitely. It’s not exactly the same for each of us, but it’s close. Sometimes we swim “forever pace plus a little,” which is a little faster. Faster than that we call moderate or fast. The “bagel mile” is the last mile we plan to swim that morning. It tends to be swum a bit faster, as we are “chasing a bagel”: the faster we finish, the sooner we’re sitting together eating delicious bagels at the bagel shop down the street. We love the bagel mile. –> Louise nurses an EFS Liquid Shot which comes in a grenade-shaped container, and drinks an extra diluted EFS electrolyte drink. –> Laura drinks Accelerade, a sports drink with protein, and has been known to bring bits of fresh kiwi in a discarded grenade container supplied by Louise. –> I bring two water bottles, one with water, the other with EFS electrolyte drink, and a handful of Chocolate Outrage Gu, which is instant energy plus CAFFEINE! Next week in Malta I will learn about far more technical and serious feeding regimens, as I participate in the SwimTrek long distance training alongside veteran and aspiring English Channel swimmers. Stay tuned. Sometimes we swim in 1750 yard increments, and sometimes we swim for 30 minutes, which comes out to about 1850 yards. Louise likes to swim by time, as it allows her to relax, not do any counting, and practice “sighting the clock.” I like to swim for 1750 yards, because it gives me incentive to swim a little faster and finish a little sooner. We are hoping to jump into open water for the first time this season on May 21st. Louise checked out the water at Brighton Beach on a bike ride with her son last week and reported that it was "too cold." *Louise and Laura continued on without me for an addition mile last Saturday. As I am gearing up for Malta next week, and wanting to feel strong, rested and not sore, I didn’t join them. They reported feeling fine, but ravenous all day long. « Why is a “pool mile” not an “actual mile”? When you guys swim the long Saturdays in the pool, do you guys swim in line directly behind each other, swim about a 1/3 of ?time? behind, or swim side-by-side for a real OW-type workout?